Used Container Chassis, Gensets, Flatbeds, Dollies, Axles, Refrigerated Trailers and All Transportation Equipment. IMGInternational Commerce Co, sells used 20 Foot Tri axle Container Chassis, This is a heavy duty tri axle 20 ft chassis, Carries one 20 ft ISO Container rated for 24 metric tons when using a 16,200lb tractor. We sell and export Used 20 Foot Tri axle Container Chassis in “as is” condition or in “remanufactured” condition. Meets all DOT, TOFC, AAR, FMVSS, ANSI, SAE and TTMA specifications. 33’ when close and 41’ when open, Weight aprox 11,200 lbs. King pin location 15 inches from front of chassis. Spring suspension. Good chassis to be used in USA, since they comply with the Bridge formula. We have also available used tri axle 20’ ft Container Chassis, which is 23’6” when close and 27’6 ” when open, tandem slides 48”. This chassis carries one 20 ft ISO Container. Weight aprox 7,900 lbs. King pin location 15 inches from front of chassis. Spring suspension. 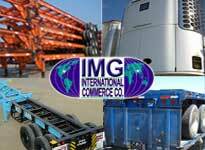 IMG International Commerce Co. sells and export container chassis in “as is condition” and also in “remanufactured – refurbished” condition. SI deseas puedes encontrar todo este contenido en español. Leer mas.